On Monday, March 19 at 6:30 p.m., a rescheduled meeting of the University of Rhode Island Student Senate was called to order. The meeting covered all pending bills and announcements from the cancelled March 7 meeting. Finance Chair Samantha King presented all submitted budgets for recognized student organizations. The budget laid out the 2017-2018 fiscal year allotments for the organizations, their requested amounts and the proposed allotments for the final budget pending passing. Organizations with external bank accounts that have failed to submit their statements from the last two months may be losing their funding if they do not submit the aforementioned statements prior to the passing of the budget. “We cannot allot equitable funding if we do not know how much the organizations already have,” said King. After reviewing the potential budget allotment of funded organizations, each council shared their announcements. The Academic Committee previewed the upcoming Affordable Course Material event. External Affairs Committee announced Narragansett Town Hall meetings happen on Mondays, and there will be a beach cleanup on April 27. The Cultural Affairs Committee will be hosting their March diversity event on March 29 in the Women’s Center Library. Campus Affairs Committee will be planning Sexual Assault Awareness Week. Two bills proposed contingency grants with non-senate approved student organizations to co-sponsor events. Both D.I.V.E. 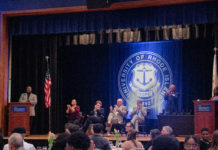 RI and RhodyThon were awarded $5,000. A bill was proposed calling for the revision of Article IV of the Senate bylaws, which was approved. The Bylaw Committee requests any ideas for revision to be brought to them, so that all changes can be finalized prior to the swearing in of newly elected officials. President Ryan Buck introduced upcoming events including “Kick Butts” week run through Health Services and the College of Pharmacy, as well as other health lectures being hosted in Hardge Forum including “Sitting is the New Smoking” and a stress management presentation.